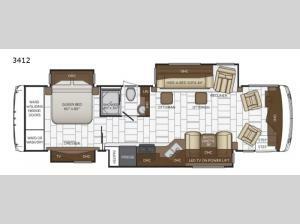 Load up your family and start traveling to new destinations in this 3412 Ventana motor home class A by Newmar. This model features quad slide outs, and space to spread out for your family of four. In the living area you can come relax at the 84" hide-a-bed sofa with ottomans or at the recliner. The bathroom has a 40" x 30" shower, sink, and toilet so you can easily get ready for the day. In the rear bedroom you will find a queen bed and across the room there is a dresser with a TV above.